Bull City Mutterings: So Why Trivialize Rehabbing The National Mall? 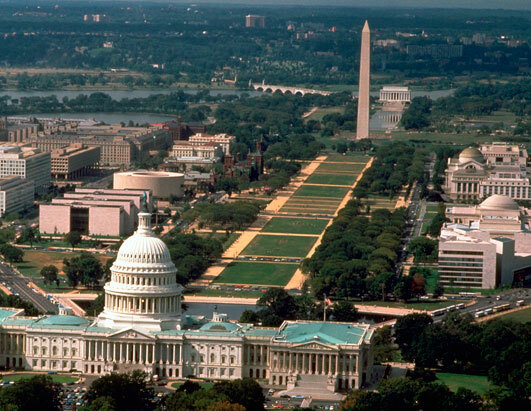 So Why Trivialize Rehabbing The National Mall? Why did a Republican official who, I assume, wanted to politicize the stimulus package, trivialize the long overdue expenditure to rehabilitate the National Mall? Because he could; and it worked. Taking shots at the expense of Washington played on people’s stereotypes. Not the greatest motive but it worked. Or maybe I’m being too harsh and he’s just against grass or the color green. What isn’t clear is why proponents caved and took it out of the stimulus bill. Is creating landscaping, architectural and planning jobs any less significant than creating jobs to construct bridges? A job is a job. Why not create a bunch of them restoring America’s front yard which has suffered through a decade of neglect? After all, we want to restore America’s image abroad, so why not start with some curb appeal for those currently making the effort to visit and see what we’re all about? Same thing comes to mind as we see governmental departments bullied by politicians and news stories into slashing conventions and meetings. Do we really think the thousands of jobs this will cost retail stores, hotels, meeting facilities, theaters, ballparks and restaurants will take the economy in the right direction? Not to mention that most conventions and meeting delegates are visitors and by definition visitors are a stimulus. One TV station even went out of its way recently to term a story about a meeting by a state agency as an “undercover investigation.” Believe me the only reason it would be “undercover” is to keep another media outlet from scooping the idea. But we all know why the insinuation was made. And viewers are suckers for intrigue. But in each of these instances, are we really doing the country and the public a service by politicizing issues in such a way that they create more job losses? Wholesale cutting of travel including conferences is as dumb as suggesting that because there is a downturn we shouldn’t pay our taxes this year or watch television. And let’s find a way to get busy rehabilitating and restoring the National Mall to something American’s can point to with proud. Washington D.C. belongs to all of us. And those jobs are every bit as important as mine or yours. Should News Enlighten or Dumb Us Down?